Wang Mang (ca. 45 B.C.-23 A.D.) - There was a brief interlude in the Han Dynasty as a man by the name of Wang Mang usurped the throne and founded the short-lived Xin Dynasty from 9 A.D.-23 A.D.. He was a court official who was related to the ruling Liu family by marriage. His father, Wang Man, was the half-brother of Empress Wang Zhengjun, the consort of Emperor Yuan. Yuan was succeeded by the emperor and empress's son, Cheng, who was Wang Mang's half-cousin. As a member of the royal court, Wang Mang did not achieve a very high status, primarily due to the death of his father while Mang was young. It was the father's job to lobby on the son's behalf for a higher station in the emperor's court. Finally, in 16 B.C., Mang was made a marquess (roughly an earl). After that his fortunes began to improve. His cousin, Emperor Cheng, died around 7 B.C. without an heir. 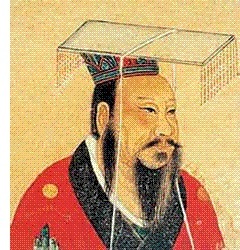 Cheng's nephew, Liu Xin, was named successor and crowned Emperor Ai. His reign lasted only six years when he died (cause not known), also with no heir. So Ai's cousin, Prince Jizi, was crowned Emperor Ping. He was only nine years old. Throughout these successive reigns, Wang Mang's aunt, the Empress Wang Zhengjun was still alive and wielded considerable influence in the royal court. She appointed Mang regent until Ping came of age. This put Mang in a unique position to impact China's future. In a larger political sense, the Han Empire was in an extremely weakened state. Mang saw an opportunity to not only overthrow the emperor, but the entire dynasty. He instituted reforms and surrounded himself with allies who would insulate him from potential enemies. Finally, in 6 A.D. he made his move and poisoned Emperor Ping; then in the year 9 claimed the throne for himself. Since he was an illegitimate heir, this was considered the end of the Han Dynasty (albeit temporarily), and the start of the Xin. By most accounts he was a terrible emperor and ruler of contradiction. He espoused Confucianism and appointed Confucian thinkers as advisers, but rarely followed its teachings. His goal was to return China to the early years of the Zhou Dynasty which he viewed as a golden age, but his policies made life more miserable for its citizens. In 9 A.D., he confiscated all private land and made it the property of the state. The following year he levied new taxes, including an income tax, the first ever in China. The most disastrous policy was the issuance of approximately 28 forms of currency throughout the empire. This led to widespread counterfeiting and corruption. All these hardships led to unrest, and surviving members of the formerly ruling Liu family were able to stir up rebellion against the usurper. They attacked the imperial palace in 23 and Wang Mang was killed in the assault. The Han Dynasty was restored two years later.